This week, Tiger comes back to show off all of his hard work on his new golf swing. Nobody really knows what Tiger has been up to, but it’s safe to assume he has been working his derrière off to get ready for the Frys.com Open October 6th – 9th. After all, I’m sure he feels obligated to justify Fred Couples sticking his neck out for him choosing him as one of his President’s Cup picks. We haven’t checked in on Tiger Woods in a few months since he dumped his swing coach, his agent, and his caddie. Let’s take a look-see, shall we? ?Turns out... yup, he’s still a D-Bag. Last week, he decided he wanted Dustin Johnson’s caddie, Joe LaCava. So you know Tiger. What Tiger wants, Tiger gets --regardless of anybody else. You golf geeks out there might remember the name Joe LaCava. He caddied for Fred Couples for most of the '80s, '90s, and 2000s. Just recently, Fred (who actually considers other people when making decisions) told Joey to go ahead and find more regular work. Even though Fred is quite successful on the Champions Tour, his ailing back makes it hard to stick to a regular playing schedule. Joey hooked up with DJ in August, a shooting star on the tour who promptly won at the 2011 Barclays. Then Tiger cad-jacked DJ last week. My question is: Why in the world would Joey leave DJ for Tiger? Sure, I understand that Tiger is the best player to have ever teed it up, and I don’t think he’s done winning yet. But jumping from Dustin Johnson to Tiger Woods right now is like cashing in your 401K to load up on BP stock. The only difference is Tiger has showed no progress in fixing any of his leaks and has taken responsibility for nothing. 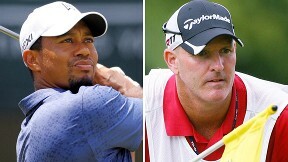 We shall see this week if Tiger has worked hard to justify Freddy using one of his President Cup picks on him. My guess is he won’t make the cut.